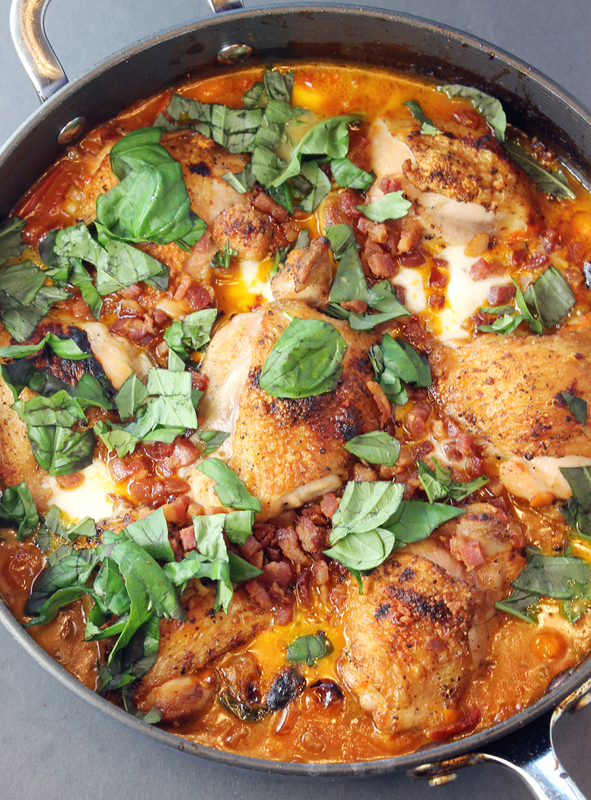 A one-pan chicken dish with the taste of a Margherita pizza. Close your eyes, dig a fork in, and you might just swear you were eating pizza. 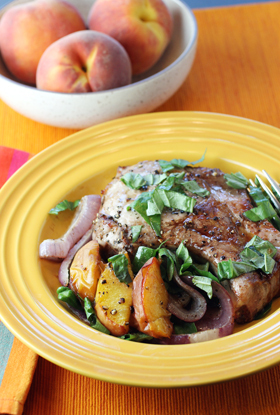 But this one-skillet wonder is crust-less and carb-light. “Pizza Chicken” does indeed have all the flavors of a Margherita pizza — mozzarella, basil and tomatoes, along with briny anchovies, capers and porky pancetta. But it’s chicken that forms its foundation. 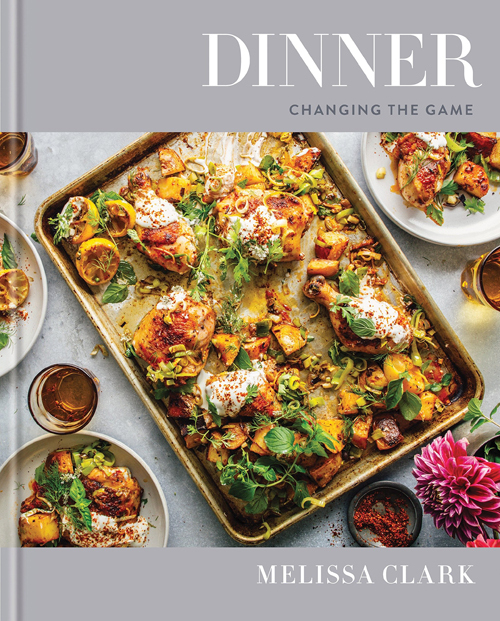 This sure-to-be new favorite is from “Dinner: Changing the Game” (Clarkson Potter, 2017) by Melissa Clark, of which I received a review copy. I can’t say enough about this book, which is filled with delicious — and realistic — ways to get dinner on the table with little fuss. “Pizza Chicken” cooks up in one skillet. The recipe advises to use a 10- or 12-inch one. Either the chicken thighs I bought were larger or who know’s what, but I ended up needing to use a 14-inch oven-safe skillet. So, just be aware that you might need a larger pan than called for. 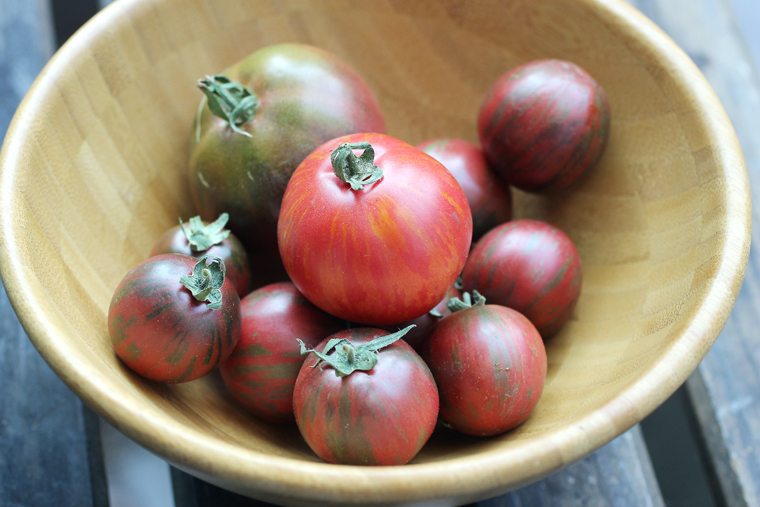 This is a perfect dish to showcase home-grown tomatoes before their season ends. I wish I could say that those lovelies below were nurtured by my own hands. But alas, they were a gift from my brother, whose thumb is far greener than mine and who doesn’t have critters who go munch in the night. Tomatoes fresh from my brother’s garden. Fresh tomatoes, cooked down a bit, make up the sauce, which gets a little milky-creamy once the mozzarella balls are added and begin to melt into puddles. The pancetta bits are almost like pork croutons. The chicken gets crisp under the broiler before serving, too. You might just want some grilled bread alongside to dunk into the bright, deeply flavored tomato sauce. It makes this saucy dish even more pizza-like. And there’s nothing wrong with that. Who can resist a dish with melty mozzarella? Pat the chicken dry and season the pieces with 1 1/2 teaspoons of the salt and 1/2 teaspoon of the pepper. Heat a 10- or 12-inch oven-safe skillet (you might need a 14-inch one, just fyi) over medium-high heat, and add the olive oil. Let the oil heat up for a few seconds, and then add the pancetta. Cook, stirring frequently, until it’s well browned and crisp, about 3 minutes. Use a slotted spoon to transfer the pancetta to a paper-towel-lined plate. Add the chicken to the skillet. Sear, turning the pieces only occasionally, until well browned on all sides, about 10 minutes. Transfer them to a large plate. Pour off all but 1 tablespoon of the oil in the skillet. Add the garlic, anchovies if using, capers, and chile flakes to the skillet, and saute for 1 minute. Stir in all the tomatoes, the basil sprig, and the remaining 1/2 teaspoon salt and 1/2 teaspoon pepper. Cook and break up the tomatoes with a spatula, until the sauce thickens somewhat, about 10 minutes. While the sauce is cooking, heat the oven to 400 degrees. 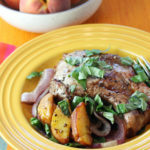 Return the chicken to the skillet, transfer the skillet to the oven, and cook, uncovered, until the chicken is no longer pink, about 30 minutes. 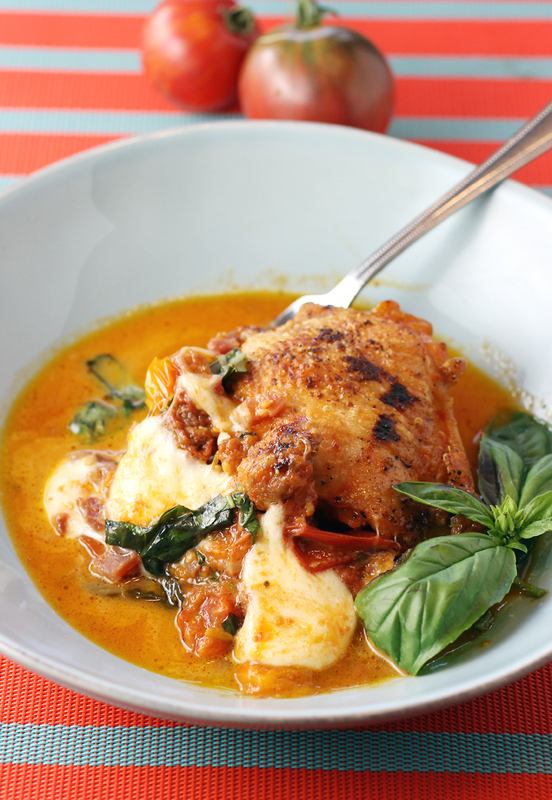 Remove the skillet from the oven and scatter the bocconcini over the chicken. Turn on the broiler, place the skillet under the heat source, and broil until the cheese is bubbling, 1 to 3 minutes (watch it carefully). Garnish the chicken with the pancetta and basil before serving. Melissa Clark is a wonderful cook — always enjoy reading her in the NYT. This is a brilliant idea — easy, a bit healthier than actual pizza, and looks wonderful. Bet it tastes wonderful, too. Super recipe, sounds like an excellent book. Thanks! really need to get my hands on that book, at least from the library for a little while! all the recipes i’ve seen from it sound fantastic, and this one’s no exception. This sounds amazing! Love a Margherita pizza, never thought to add chicken, but since I’m trying to be carb-low, this is going on my recipe list to make. Hellooooo, savory deliciousness. And wonderful edible gift from your brother!